The first reviews are in and Living the Questions’ new Painting the Stars series is receiving kudos as the new catalyst for dynamic and liberating conversations about the communion of science and faith — all around the world. Featuring over a dozen leading theologians and progressive thinkers, the seven-session program explores the promise of evolutionary Christian spirituality that has been gaining momentum in thoughtful circles of Christians across the globe. The challenging and engaging participant reader was written especially for this program by evolutionary theologian Bruce Sanguin. When you purchase the curriculum edition, you receive a code to access the downloadable/printable overview and reader. The downloadable material also includes a facilitator guide, detailed discussion questions coordinated with the video segments, and original prayers/poems written for each session by Michael Morwood. The basic format for each 1-1 1/2 hour session includes conversation around the readings, a 20-minute video presentation and guided discussion. Click HERE for info on purchasing the curriculum edition. Painting the Stars is also available as a Home Edition licensed for private home viewing only. Each of the seven episodes runs approx. 20 minutes. Please note that, when purchasing the home edition, none of the downloadable material is accessible and the videos are not to be used in group settings. 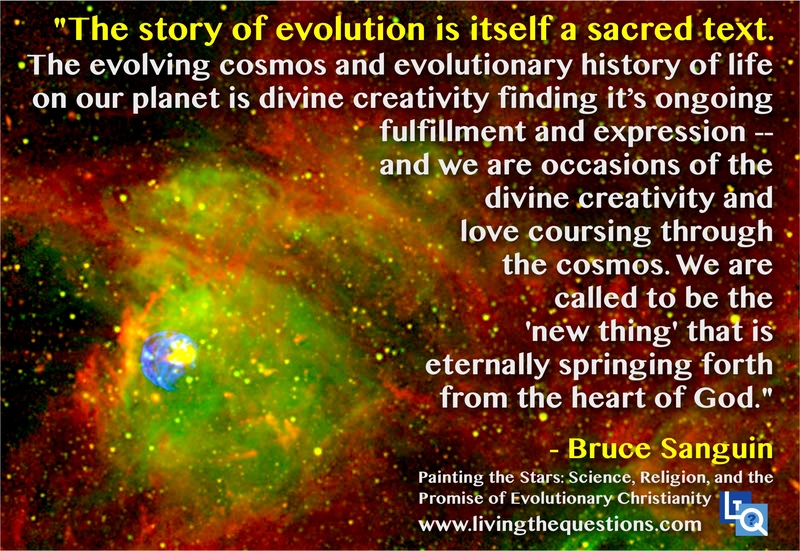 Bruce Sanguin understands evolution as a divine strategy for making a world that can make itself, and that God is in the business of alluring all of creation into the deep enjoyment of realizing the highest possible expression of goodness, truth, and beauty. As a Christian, Sanguin believes the Heart and Mind of God–that which was in Jesus–is incarnate in every bit of this blessed universe and planet of ours. Along with the rest of life, we need to creatively adapt to changing life conditions, or suffer the evolutionary consequences — which we’re seeing with the decline of the mainline churches. The crisis that we’re going through right now on the planet could very well be birth of a new reality. This creative adaptation and innovation is driven by Spirit. It’s up to us to be part of the evolution. Rev. Bruce Sanguin is the Minister of Canadian Memorial United Church and Centre for Peace in Vancouver, B.C. He is a leader in evolutionary Christianity, teaching evolutionary theology and practice with a passion for updating the theology and practice of the church in light of the reality of evolutionary processes and the creative impulse of the universe.